The Ruelco Self-Contained System is designed for the automatic closing of hydraulic actuators where an external power source is not available. The system allows the operator to easily and reliably open the well control actuator while ensuring proper functionality. The low and high pressure accumulators will maintain system pressure through temperature fluctuations. 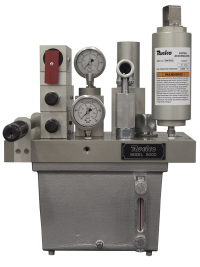 The integrated pressure switches allow for precise high and low pressure control of the flow line, and will automatically act to shut down the actuator. Manifold design with no external tubing on the unit reduces leak points as well as reduces likelihood of damage at job site. All material is NACE rated using anodized 6061-T6 aluminum and 316 stainless steel. 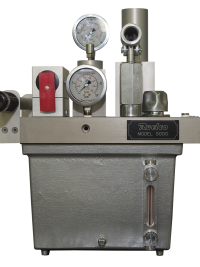 Low and high pressure relief valves preset to desired pressure to prevent damage to actuator or low pressure equipment. Quick exhaust (optional) for fast response time. 40 micron suction filter to prevent contamination of system. Stainless steel gauges with dual scales. 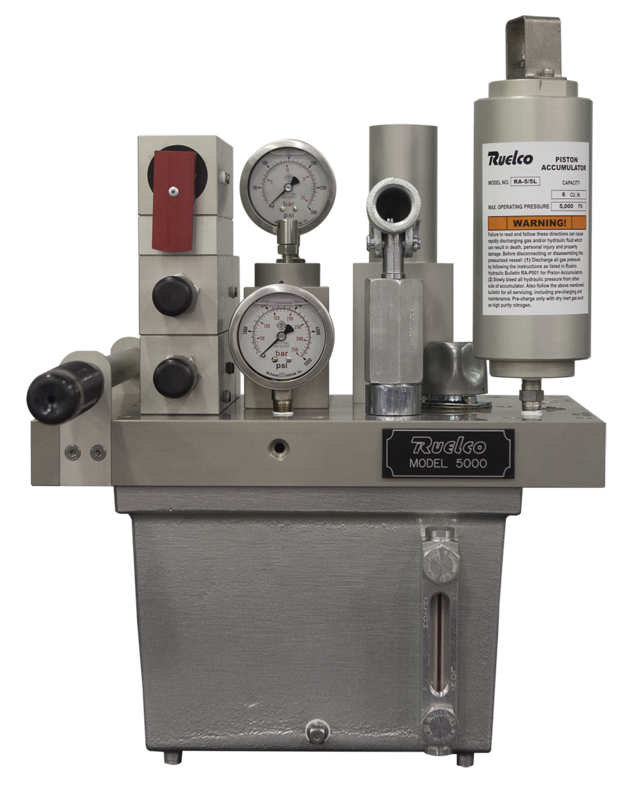 Integrated pressure switches (optional) allow for flow line control without additional components and reduce the tubing required for installation. Seal material used allows full functionality from -50 Deg. F to 180 Deg. F (Alternative seal materials available upon request). 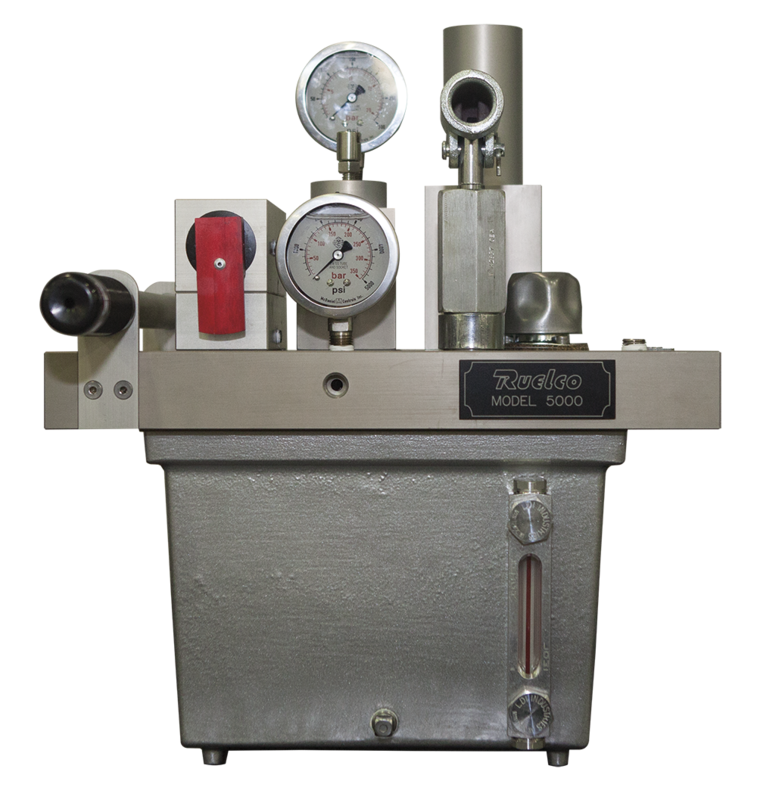 High (optional) and low pressure accumulators accommodate for thermal expansion volume changes. System is easily opened with use of red anodized latch. Sight glass on tank allows for visual level indication of system. Check valve on suction tube ensures a constant prime of the pump.